7/2012 Doosan Lynx 220LC CNC Turning Center s/n ML0022-005652 w/ Doosan-Fanuc-i Series Controls, Tool Presetter, 40-4000 RPM, 12-Station Turret, Hydraulic Tailstock, 20.1” Swing Over Bed, 11.4” Swing Over Carriage, 20.7” Max Cut Length, Parts Catcher, 8” 3-Jaw Power Chuck, 5C Collet Closer, Coolant. 7/2012 Doosan Lynx 220LC CNC Turning Center s/n ML0022-005651 w/ Doosan-Fanuc-i Series Controls, Tool Presetter, 40-4000 RPM, 12-Station Turret, Hydraulic Tailstock, 20.1” Swing Over Bed, 11.4” Swing Over Carriage, 20.7” Max Cut Length, Parts Catcher, 8” 3-Jaw Power Chuck, 5C Collet Closer, Coolant. NOV 2010 Ganesh Cyclone-32GT Multi-Axis CNC Screw Machine s/n CS991101 w/ Ganesh CY-25M Controls, 6000 Max RPM, 8-Station Turret, 4-Station Live Drilling/Milling Head Attachment, 5 ¼” 3-Jaw Power Chuck, 5C Collet Nose, Dead-Length Collet Nose, Parts Chute, Coolant. Drilling/Milling Stations, “C”-Axis Rotation @ 0.001 Degrees, (5)Front Drilling/Boring Stations, (6)Turning/Grooving Stations, 5C Collet Nose, Parts Chute, Chip Auger, Coolant. CAT-40 Taper Spindle, 10,000 RPM, 15Hp Motor, Metric Ball Screws, AC Motors, Servo Coolant, 8 Meg Memory Expansion, Rigid Tapping, High Speed CPU, Graphics, Color Monitor, USB Port, 16” x 39 ½” Table, Coolant. CAT-40 Taper Spindle, 10,000 RPM, 15Hp Motor, Metric Ball Screws, AC Motors, Servo Coolant, 8 Meg Memory Expansion, Rigid Tapping, High Speed CPU, Color Monitor, USB Port, 16” x 39 ½” Table, Coolant. 2002 Fadal VMC 4020 4-Axis CNC Vertical Machining Center s/n 012002054301 w/ Fadal Multi Processor Controls, 21-Station ATC, CAT-40 Taper Spindle, 10,000 RPM, 4 Meg Memory Expansion, High Torque, Rigid Tapping, High Speed CPU, Graphics, Color Monitor, 20” x 48” Table, Coolant. Whacheon / Webb mdl. WL-435 (17Gx40) 17” x 40” Geared Head Gap Bed Lathe s/n 9-8412-06 w/ 32-1800 RPM, Inch Threading, Tailstock, Steady Rest, KDK Tool Post, 10” 3-Jaw Chuck, 5C Collet Closer, Coolant. 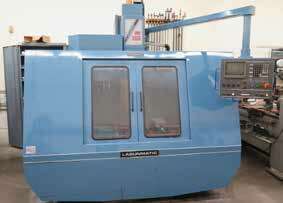 Hardinge DSM-59 Second OP Lathe w/ 6-Station Turret, Cross Slide, 5C Collet Closer, Coolant. pindle, Chrome Ways, 9” x 42” Table. Harig 612 Surface Grinder w/ Mitutoyo 2-Axis DRO, Walker Fine-Line electromagnetic Chuck. Boyar Schultz Challenger H612 Surface Grinder s/n 28708 w/ Magnetic Chuck. Chicago Electric 90 Amp Flux Wire Welder. Delta mdl. 15-330 Pedestal Drill Press s/n GU-625824F86 w/ 300-4700 Dial Change RPM. Central Machinery Table Model Drill Press. Central Pneumatic Bench Model Dry Blast Cabinet. (2)Chicago Electric Drum Style Media Tumblers. Central Pneumatic Refrigerated Air Dryer. Frejoth Vertical Mill w/ Sargon DRO, 90-2780 RPM, 8-Speeds, Chrome Ways, Power Feed, 9” x 42” Table. Ex-Cell-O mdl. XLO Vertical Mill w/ Sargon Prospector DRO, 66-2500 Dial Change RPM, R8 Spindle, Chrome Ways, 9” x 42” Table. Fadal 4th Axis 6 ½” Rotary Head w/ 6” 3-Jaw Chuck, 5C Collet Closer and Mill Canter. Lista 11-Drawer and 7-Drawer Tooling Cabinets. Lista 5-Drawer Rolling Tooling Cabinet. Boring and Tapping Heads Angle Plates. 18” x 20” x 16.54” Work Envelope. Mitutoyo PH-3500 14” Optical Comparator s/n 110160 w/ Mitutoyo MicroPak-2RS Programmable DRO, Digital Angular Readout, Surface and Profile Illumination, Stand. Starrett Crystal Pink 36” x 36” x 6” Grade “AA” 2-Ledge Granite Surface Plate w/Stand. Starrett No.755 24” Digital Height Gage. SPI Digital Bore Gages 2”-3”, 1.6”-2”, ¾”-1”, 3/8”-1/2”. Tesa and Fowler 6” Digital Calipers. Fowler 1”-2” Digital OD Mic. Mitutoyo 7”-8”, 6”-7”, 3”-4”, 1”-2”, 0-1” OD Mics. Meyer Pin Gage Cabinet .061”-.625”. 36 ½” x 42” Granite Surface Plate. Caterpillar mdl. T30D 3000 Lb Cap LPG Forklift s/n T30D5GB2335LP w/ 2-Stage Mast, 154” Lift Height, Cushion Tires.